House and time at Malvern: No 8, 1899 - 1900. Died: 19 October 1914 aged 29 in Belgium. Killed in action in Belgium. Born 4th April 1885. Son of Canon Thomas Percy and Patience Frances Sophia Pemberton, Gilling East, York, and Trumpington Hall, Cambridge. Trinity College, Cambridge; "C" Sqdn. 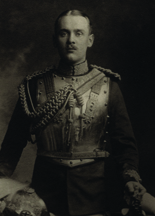 2nd Life Guards 1909; Captain 1914. Husband of Winifred Mary Colegate (formerly Pemberton), of 16, Prince's Gardens, London. 'He took his course at the Cavalry School at Netheravon 1911—12, and in May of the latter year was seconded as Cavalry Instructor to the Oxford and Cambridge O.T.C., but on the outbreak of the European War was recalled to his regiment; went to France with the Household Cavalry Brigade, 3rd Cavalry Division, Expeditionary Force, on 6 Oct. 1914, and was killed in action near Moorslede (between Roulers and Staden) 19 Oct. following. He was a fine all-round sportsman, a splendid cricketer, a keen huntsman, and a very good shot. And had a great natural and charming gift for music. He was a playing member of the M.C.C., also of the Cambridgeshire County Cricket Club, a vice-president and member of the Trumpington Cricket Club. He married at Hovingham Parish Church, 30 Apr11, 1912, Winifred Mary (Hovingham Hall, Malton), eldest daughter of Sir William Henry Arthington Worsley, of Hovingham Hall, 3rd Bart.' (De Ruvigny).